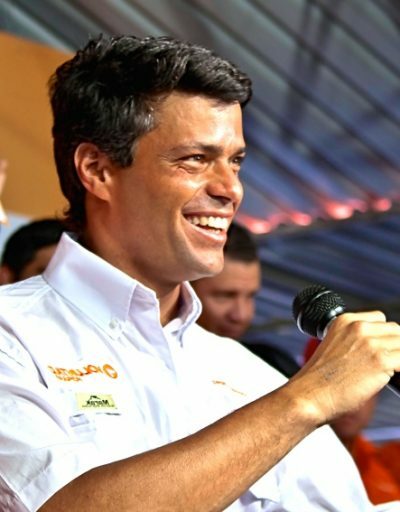 In September 2015, anti-Bolivarian fascist coup plotter Leopoldo Lopez was sentenced to nearly 14 years in prison for inciting months of violence and related crimes against the state. They resulted in 43 deaths, many injuries and destruction of public property. Lopez got off lightly. In America, he’d likely have been prosecuted and convicted of sedition, sentenced to decades or life in prison. Along with co-conspirators, he launched a US-supported La Salida (the Exit) campaign, openly calling for ousting Venezuela’s government, inciting street violence to replace Bolivarian social democracy with fascist rule. Why he was released to house arrest is unclear. He’s free through cohorts to incite continued violence and other seditious acts – though his activities will likely be closely monitored, risking re-imprisonment if he steps too far out-of-line. “This is a step toward freedom, not just Leopoldo’s, but also a step that brings all Venezuelans closer to freedom,” opposition fascist lawmaker Freddy Guevara blustered. “(n)ow is the time for sustained pressure on Maduro,” claiming his client’s release to house arrest “confirms that the relentless pressure is working” – a highly disputable comment. If he resumes his criminality, he’ll likely end up back where he belongs, along with other insurrectionist elements. Venezuela’s Supreme Court called his transfer to house arrest a “humanitarian gesture,” citing unexplained health issues. The move comes at a time of likely US-orchestrated street violence since April, leaving scores dead, many others injured and hundreds arrested. In June, US Senate legislation authorized $20 million for regime change in Venezuela, another $10 million for so-called “democracy building” Washington abhors. Before taking office as secretary of state, Rex Tillerson said he’ll “seek a negotiated transition to democratic rule in Venezuela” – code language for regime change. Dark forces in Washington are likely plotting their next moves, aiming to replace Bolivarian fairness with fascist rule serving there interests – eliminating Venezuelan sovereign independence and gaining control over its immense oil reserves. That’s what years of US hostility toward the country is all about under Chavez and Maduro.